The project „Jugend is(s)t berichtend in Bewegung“ is focused on the creation of a health report, done by pupils for pupils, from four Styrian schools for agriculture and food management. 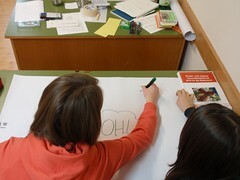 It is based on project, mainly financed of the organisation “Fonds Gesundes Österreich”. The aim is to gain experience and knowledge in working together with the target group during the reporting process and to obtain data of the health behaviour and state of health of adolescents. Choice of subjects, data collection, suggestions for improvement and the creation of the health report will be carried out in collaboration with the pupils. Data can be- depending on the interest of the pupils - collected in various ways: questionnaire surveys, sport motor activity tests, nutritional protocols, nutritional calculations and qualitative social science methods. To ensure sustainability and traceability of each step, a manual with instructions for producing public health reports will be developed in cooperation with pupils and teachers of the participating schools. The predominantly female pupils of the schools for agriculture and food management will get to know various disciplines and the basic of scientific research, which should help to make them familiar with the possibilities of further education in tertiary educational institutions. Thus, the project makes an important contribution to the strategic objectives of the advocacy program "Sparkling Science", such as removing entry barriers to science and the improvement of transparency. The preparation of a handbook for teachers with instructions for creating a health report should also give incentives to develop topics with an interdisciplinary approach.